In this article we will introduce things about the semi-permanent makeup. 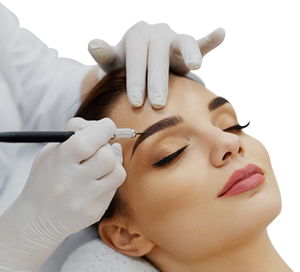 Semi-permanent makeup also known as cosmetic tattooing or permanent makeup, is a method of inserting small amounts of pigment into the dermal layer of the skin using incredibly fine and accurate probes in order to enhance or recreate features. Semi-permanent makeup typically consists of simulation the conventional application of eyeliner, eyebrow pencil, lip liner and lipstick. Various looks can be achieved from dramatically bold, to soft and natural. Semi-permanent makeup (SPMU) uses specialised procedures whereby color is inserted into the skin’s outermost layer (the epidermis) and the deep layers (the dermis). Immediately following the SPMU treatment, the color will look darker than you might expect. This is due to color remaining in the outermost epidermal layers of the skin at the start of the process. However the color will soften within a few days during the healing process, as the upper layers of epidermis are replaced by new epidermal cells. On the face it is better to under-do than over do. Therefore your technician will invite you for a second appointment after one month of healing (which should be at no extra charge) to have a ‘top-up’ treatment. At this stage you will have had four weeks to get used to the makeup so you will be know how much darker/thicker you wish to go to achieve your desired result. SPMU can last up to 2-3 years however to keep the results looking at their best it’s recommended that you undergo a top-up treatment every 18 months or so.Depending on your skin type, age, health, facial products used, environmental and individual factors to keep the look fresh and complete. Like tattoos, SPMU can be difficult to remove however common techniques used are laser resurfacing, dermabrasion (physical or chemical exfoliation) or surgical removal. None of these procedures are simply undertaken so this is why it is important to be certain before undergoing SPMU treatments. What are the benefits of SPMU? Individual eyebrow hairs can be mimicked with fine needles using hair strokes and eyeliner can add definition to eyes. It is smudge-free and waterproof. It can create a natural look without the need to use conventional makeup. It saves time by not having to apply conventional makeup such as eyeliner, eyebrow pencil, lipliner or lipstick. The final results may be too dark, the wrong color, uneven or too thick. A trained and experienced SMPU technician will be able to adjust the color and evenness of SPMU results in most cases. The SMPU industry is not regulated. Therefore ensure you carry out in-depth research about technicians and clinics to check they are skilled. Ideally you want one that specialises in working with clients experiencing partial or total hair loss. Check out the previous results of any technician you are thinking of using. A good technician should be able to offer you a portfolio of previous work to view. Styles can vary considerably between technicians; you need to be sure you are happy with whoever you select. Be sure to specifically ask to see examples of their work on clients with alopecia. Agree to the shape and color before having it done. Most technicians will give you an idea of what new brows will look like by doing a pencilled version first. Any concerns? Speak up! But remember that the technician is unlikely to come up with exactly the same brows that you had prior to alopecia. Listen to their advice but be sure to let them know if you’re not happy. Remember that if you have been without eyebrows for quite a while, having them reapplied to your face can be quite a shock to the system. Just as it took a while to adjust to having no brows, it can take a while to get used to having some again! Do not feel pressured by anyone else to have SPMU. The decision to have the treatment should be yours. We know that SPMU can really help to boost confidence and self-esteem in those with alopecia. But it’s also worth remembering that many people with alopecia don’t have SPMU and still look great! Regarding the different names – semi-permanent versus permanent – everyone’s skin is different so a technician cannot guarantee that it will fade after a specified period of time. Most say that the treatment will fade away after 2 to 3 years but in some cases it never completely fades. Hence some technicians refer to it as ‘permanent make up’. For the purposes of this webpage, we have used the term ‘semi-permanent makeup’ as it is the most widely used.